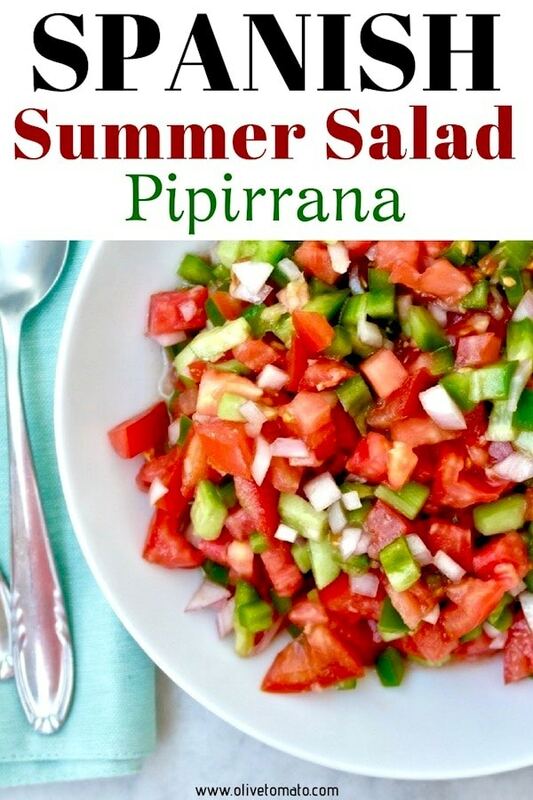 I came across this Spanish salad known as Pipirrana in a Spanish cookbook. While not very known outside of Spain, it is a great example of the use of seasonal, local ingredients that everyone has at home during the summer months. 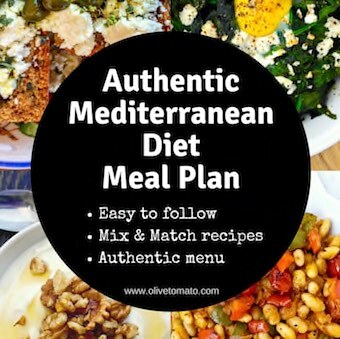 Generally, when we think of Spanish cuisine we think of tapas, gazpacho, paella and the meats, but there is a wealth of Mediterranean diet, vegetable-rich dishes in certain regions of Spain. Yes, some regions particularly the Northern regions, have a diet rich in meat dishes, but the Southern areas are characterized by a Mediterranean style of eating. This particular salad has multiple variations depending on the region it is made, in some areas the tomatoes are peeled and soaked in olive oil and the salad is mashed becoming almost like a soup, in others they may add other ingredients such as olives and lettuce. It is based on 4 ingredients: tomatoes, peppers, onions and cucumber. It serves as a base to add seafood such as octopus or tuna or an accompaniment to fish. In some cases egg is added. Here I present the basic version which is served with olive oil, vinegar and garlic. This salad is rich in vitamin C, fiber, antioxidants (which you absorb even more with the addition of olive oil). 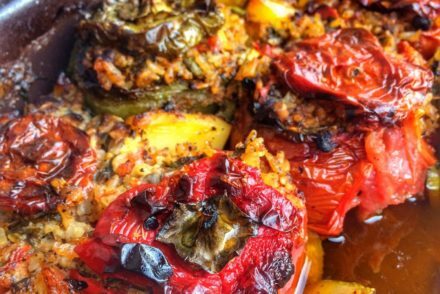 It is perfect as is, flavorful and I loved the addition of the garlic, plus I had found the most red tomatoes and was happy to use them here. After we emptied the bowl, we dipped some rusks in the leftover juice. Yum! You can also add tuna, egg etc. for a good dose of protein which will make this salad a complete meal. I think next time I will add some marinated octopus. 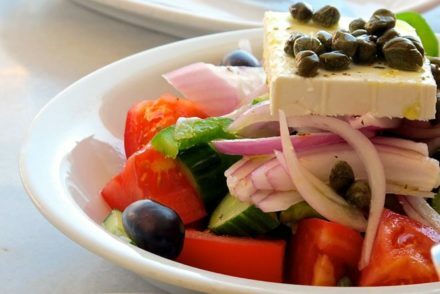 It is interesting to see the small variations between similar recipes in Mediterranean countries, so while a Greek salad has identical ingredients, there are some subtle differences. For example Greeks will generally not add garlic to a tomato salad, on the other hand we don’t see green herbs in the Spanish salad. Such small variations can result in a familiar yet new tasting experience. This salad is recommended to be eaten with a spoon and to have some good, crusty bread (or I had rusks) to soak up the juices. You can also use it as a topping for bruschetta, or serve it as a type of “salsa” on top of chicken or along with pita chips. I also think it would work great as a topping for pasta. And it is ideal as a side salad if you are serving fish. I find it tastes better after being chilled for a few hours. The most important aspect for this salad is to have the freshest and most flavorful vegetables. Chop the onion in small cubes and soak in water. 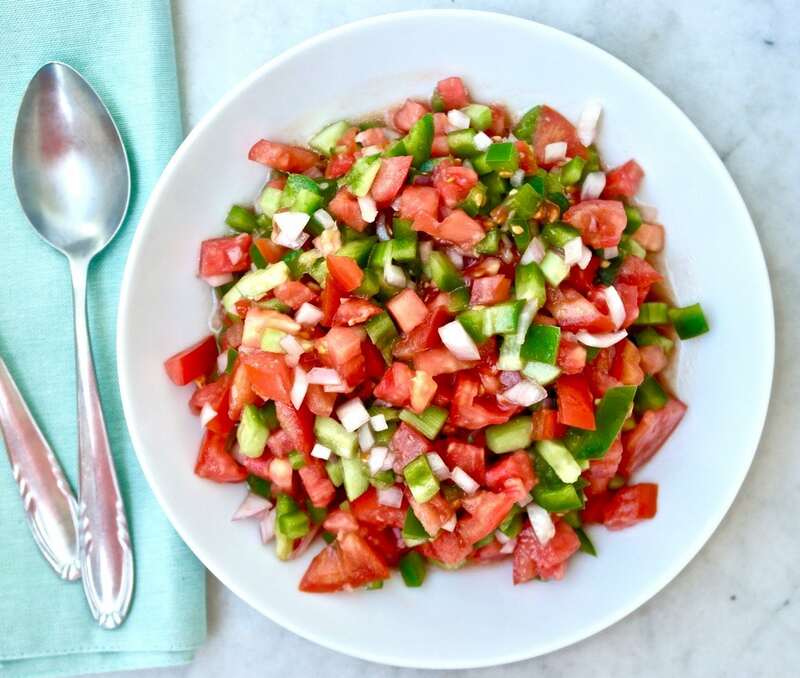 Chop the tomatoes, cucumber and pepper and place in a bowl. Drain the onions and add them to the rest of the vegetables. Place the garlic in a mortar with a pinch of cumin and a pinch of salt and a few drops of olive oil until you have a paste. In another small bowl mix the rest of the olive oil, vinegar and salt, add the garlic paste and mix well. Add the dressing to the salad and mix well. Cover and refrigerate. Serve chilled with bread or rusks. Oh my, this is my lunch every day at work. I don’t always put in green pepper or cumin, and I have to omit the onion and garlic because of the workplace environment, but I put them in at home. 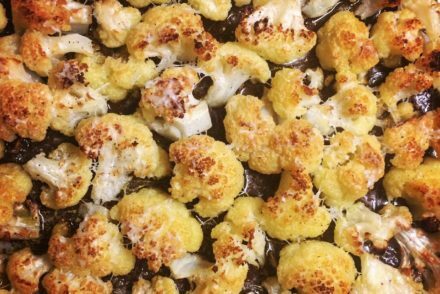 I crumble in a little feta and it is very satisfying and fills me up for hours! (I will even add fresh zucchini when it is available). Yes, I love that. One of my favourite tapas is simply mushrooms al ajillo (with a lot of garlic) Mushrooms sliced THICK, like little steaks, and grilled in a hot pan (best is iron) with olive oil and garlic. Often some finely chopped flatleaf parsley. Perhaps a bit of lemon. Made this last week (though I did change the green for a red pepper) and thought it was delicious. I didn’t have quite enough for lunch the next day (got carried away eating) so added a couple of eggs and some oregano and enjoyed it. Next time I make it, I’m thinking of putting in some tuna and some additional herbs (basil, oregano, maybe mint) just for something different. It’s so good and makes a great base for adding other ingredients to change it up.